Five months ago I moved into my new flat, and five months ago my boyfriend and I decorated our bedroom in said flat and that was the end of the home improvements. Until now. I've been saying it for a while now, but our living room is extremely bare and has no character, so the time has come to make some changes. Thanks to my recent obsession with Pinterest and Kate Lavie's blog, I have all the inspiration I need to start Project Living Room '16. I have a plain white canvas to work with so I want to insert lots of colour and texture to the room to create a fun yet calming environment. 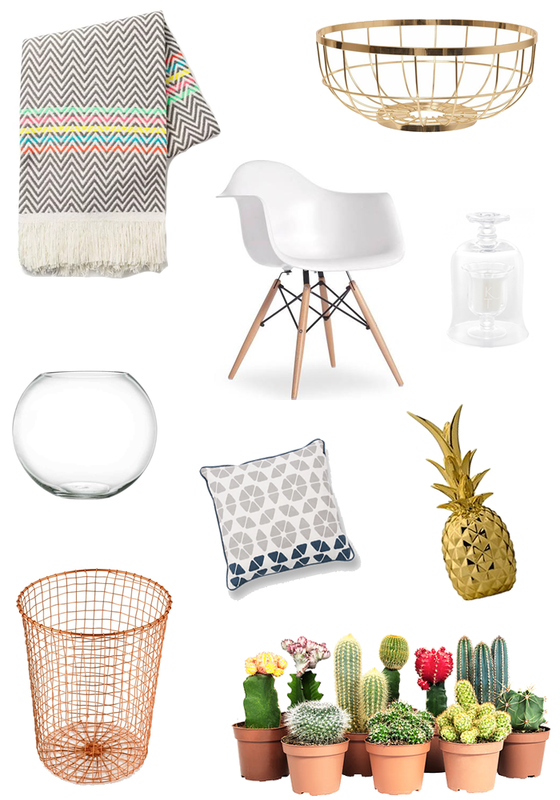 I've basically been given free reign to do what I like so this month is all about finding chic yet affordable pieces to place ever-so-effortlessly into the living room, and then go on to have hundreds of dinner parties to show off my interior deign skills. Have you got the interior design bug recently? What and where should I be shopping? Let me know! I love that throw. Nice to have a hint of colour.